Today, DependableJay reached into the vault to pull out what he calls one of his grails. Today, DependableJay reached into the vault to pull out what he calls one of his grails. Considering the insane amount of gems stored away in that vault, we knew it had to be something special. What you're looking at is the rare 'Bucks Home' Ray Allen Air Jordan 8 PE from 2003. Made in Ray's size 14, the shoe takes on the original 'Bugs' base, while adding in Bucks-inspired dark green and purple accents. Ray's number '34' is also stitched along the collar. In February 2003, Allen was traded from the Bucks to the Seattle SuperSonics, so there aren't many (if any) 'Bucks' PEs that were produced after these surfaced. Is this one of Ray's best Jordan PEs? 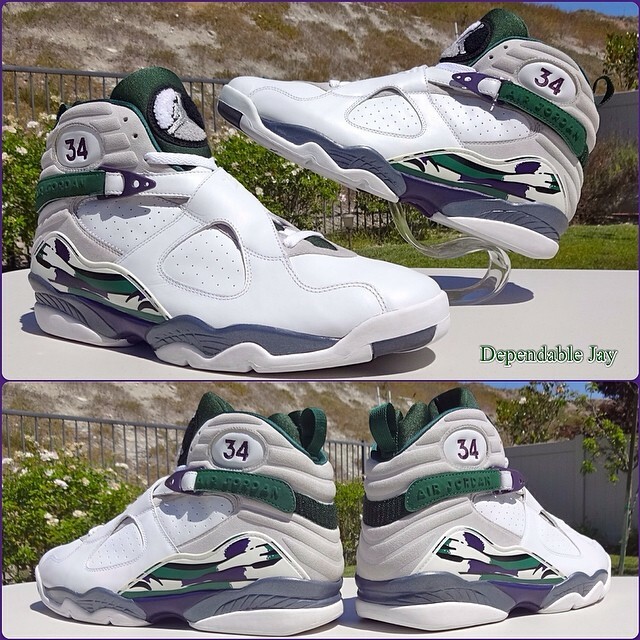 Let us know what you think below and follow @DependableJay on Instagram for more rare PEs.